The digital I/O module provides 8 lines of digital input and 8 lines of digital output via pushbuttons and LEDs. Values between 0 – 255 are read from or written to port 0, 1, 2, or 3 where the digital representation of that number is expressed with a 1 to represent a button being pushed or a LED being on. This is an evolution of the original Digital I/O Module, which now has tighter addressing and the option to select which of 4 ports are used for input or output. 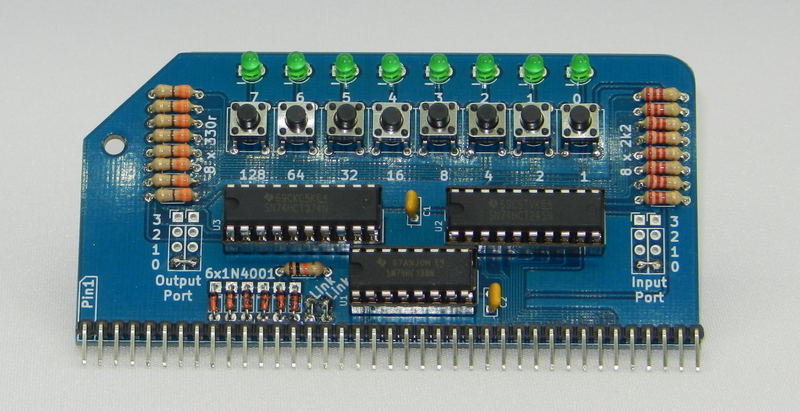 The 74LS138 is capable of 8 lines of switching, although for this board, only 2 (1 input and 1 output) are used. Typically port 0 will be used, but this is selectable from 0 – 3 by soldering links where indicated on the PCB. A0, A1 and !WR are used to select which one of the 8 outputs is enabled. Similarly, a 74LS374 flip-flop will read the data bus when the Chip Enable pin is pulled high, and output the values on 8 LEDs via 330 ohm resistors. This value is latched, so when the CE pin is no longer high, the output stays to what it was last set to.